In 1879 horse trams were introduced in Rotterdam. Together with steam trams (since 1881) and horse buses they provided the public transport until about 1906. 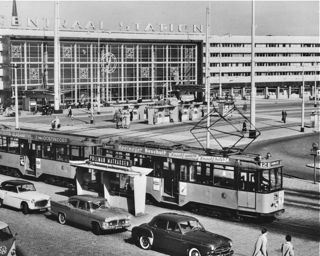 Electric trams, later supported by buses and the Metro do serve the Rotterdam people until today. On this site you can find a small overview of the history and the different types of rolling stock which existed, or still is in daily use. 1879 Opening of the first four urban lines (1435mm gauge; all horse traction; June 1, June 25, October 1 & October 15) by the RTM (Rotterdamsche Tramweg Maatschappij). 1880 Completion of the original designed urban network (with a total length of 8.3 km) of the RTM with the opening of two lines (January 18 & February 4). 1881 (April 9) Opening of the line to Delfshaven by the RTM (1435mm gauge; steam traction). 1882 (February 1) First reorganization of the urban network by the merging of two lines. 1882 (May 5) Extension of the steam tramline from Delfshaven to Schiedam (total length 6.5 km). 1882 (December 29) Opening of the tramline to Hillegersberg (length 4.4 km; 1000mm gauge; horse traction) by the SlTM (Schielandsche Tramweg Maatschappij). 1884 (May 17) First extensions to the urban network. 1884 (August 7) Opening of the line to Overschie (length 4.9 km; 1067mm gauge; steam traction) by the IJSM (IJssel Stoomtramweg Maatschappij). 1890 (August 1) Closure of the IJSM-line to Overschie. 1890 (December 14) Re-opening of the line to Overschie by the RTM (1435mm gauge; horse traction). 1898 (May 2) Opening of the line to the Hoekse Waard (1067mm gauge; steam traction) by the RTM. This was the first line of a large network of steam trams and boat services south of Rotterdam. 1902 (September 18) Opening of the urban line in Schiedam (length 2.8 km; 1000mm gauge; horse traction) by the SdTM (Schiedamsche Tramweg Maatschappij). 1904 (April 7) Taking over of the urban lines (7 lines with a total length of 18.4 km) in Rotterdam, the line to Overschie and the steam tramline to Schiedam from the RTM by the RETM (Rotterdamsche Electrische Tramweg Maatschappij). The RTM keeps the line to the Hoekse Waard. 1904 (October 1) Opening of the line to Voorne-Putten (1067mm gauge; steam traction) by the RTM. 1905 (September 18) Opening of the first electric line (nr.1) by the RETM, replacing a horse tramline. Power supply provided by an auxiliary generating plant. In contradiction to the horse- & steam tram, which never had line numbers, with the electric tramlines also line numbers were introduced. 1906 (October 15) Start of the power supply by the municipality. 1906 (October - December) Opening of the electric lines nr. 2 (October 15), 4 (October 25), 3 (November 28) and 7 & 8 (both December 17). Line 8 replacing the steam tram to Schiedam, all others replacing horse tramlines. 1906 (November 4) Opening of the first (urban) motorbus-line by the MAV (Maatschappij Algemeen Vervoer). 1907 (January 10) Depot and five (out of ten) motorbuses of the MAV destroyed by fire. 1907 (February 9) Closure of the MAV-line. 1907 (March 13) Opening of line 5, the first electric line without a horse- or steamtram predecessor. 1907 (March 27) Opening of line 6 in which the last urban horse tramline was assimilated, leaving the line to Overschie the only remaining line of the RETM with horse traction. 1908 (April 13) Opening of the first line on the south bank of the river and with this starting the first period of an isolated network of urban tramlines in the southern districts of the city. 1918 (January 1) Closure of the urban horse tramline of the SdTM in Schiedam. 1919 (January 1) Taking over of the horse tramline of the SlTM to Hillegersberg by the RETM. 1920 (June 7) Opening of a motorbus line on the south-bank by the municipality. 1921 (December 21) Closure of the bus-services of the municipality on the south-bank. 1922/3 Replacement of the narrow gauge horse tramline (former SlTM) to Hillegersberg by line 14 (period May 5, 1922 - June 6, 1923). 1923-1928 Over 100 different private companies did operate urban motorbus lines. Most of them just during a few months and with 1-3 vehicles only. 1924/5 Replacement of horse traction on the line to Overschie by motor traction (period May 19, 1924 - May 28, 1925). 1926 (September 1) Opening of the lines across the river and merging the networks on the north and south banks. 1927 (October 15) Take over of the system (with 1 motor and 15 electric tramlines) by the municipality with changing the name into RET (Rotterdamsche Electrische Tram). 1928 (May 26) Opening of the first three urban motorbus lines of the RET. 1928 (October 25) Closure of tramline to Overschie and replaced by a motorbus line. 1929 (May 1) Reorganization of the network with expansion to 18 lines. 1930 (March 24) until 1931 (May 16) The network did have its greatest extent with 25 lines. 1934 (July 1) Reorganization of the network with route changing for many remaining lines. 1936 (July 1) Reorganization of the network with route changing for most remaining lines. 1940 (May 10) Service on all lines stopped due to the German invasion making the city front-area. 1940 (May 14) Air bombing by the German Luftwaffe destroys all the centre and part of the eastern districts of the city. About 900 people killed. None of the tram-depots or tramcars were damaged. The bus-depot & 22 motorbuses were heavily damaged or destroyed. 1940 (May 16-17) Reopening of the lines of the RTM to Voorne-Putten and the Hoekse Waard. 1940 (May 17-19) Reopening of the lines 1-4, 9, 10, 14 & 22 as far they were situated outside the destroyed areas. Temporary three isolated networks in the western (lines 1 & 4), northern & eastern (lines 10, 14 & 22) and southern (lines 2, 3 & 9) districts did exist. 1940 (May 25) The networks in the western and northern & eastern districts reconnected with each other by the first line (10) through the destroyed areas. 1940 (June 5-21) Gradually recovery of the network on the northern bank with changing of the routes of many lines. 1940 (June 22) Reconnecting of the southern lines across the river with the network on the northern bank. 1941 (November 26) First extensions of the network (lines 3 & 22) into districts (Blijdorp) not served by the tram in the pre-war period. 1943 (March 31) Air bombing by the USAAF of the western districts. Besides about 400 people killed, 2 electric tramcars and a trailer were destroyed and four electric tramcars with three trailers were damaged. 1943-1944 Constructing of a cross-river trolleybus-line through the tunnel. Converting of 12 motorbuses into trolleybuses with the use of the motors of six trams (nrs. 155, 170, 175, 197, 198 & 201). The trams became trailers (with the numbers increased by 1000), but the trolleybus-line was never opened. 1944 (December 1) Services on all lines stopped. Due to the war there was a severe lack of energy and food resulting in a serious famine. 1945 (June 8) Reopening of the lines 2, 3, 8, 10 & 16. Service on peak hours only. 1945 (August 16) All day services again. 1947 (December 1) With the reopening of the lines 11 & 17, the network was recovered from the war damages. 1957 (May 8) Closure of the RTM narrow gauge line to the Hoekse Waard. 1965 (November 6) Closure of the RTM narrow gauge line to Voorne-Putten. 1967 (May 8) until 1968 (June 8) Reconstruction of the network. 1968 (February 10) Opening of the first Metro-line (Centraal Station - Zuidplein, later several times extended) replacing all tram (and most bus) lines across the river. Start of the second period of two isolated urban networks. 1982 (May 10) Opening of the second Metro-line (Capelsebrug - Coolhaven, later several times extended). 1996 (September 9) Opening of the tram-line across the river and merging the networks on the north and south banks again. 2006 Take over of the "Hofplein" railway line. 2011 The former "Hofplein" line fully intergrated with the Metro network. Through service Den Haag Centraal Station - Rotterdam Centraal Station - Slinge.